Buddhify is a simple, practical, and easy to use mobile phone application that teaches you mindfulness-based meditation on the go. It’s available on both the Apple iOS platform as well as Android. It’s designed to help in maintaining mindfulness when you live in a busy urban lifestyle. Buddhify works equally well for those with experience meditating as it does for someone who’s never meditated a day in their life. Buddhify is different than most of the other mobile meditation applications I’ve seen in the past. I’ve been a fan of Insight Timer for quite a while since it provides a simple and effective way to set a timer for your session (in today’s world sometimes we have to schedule the time to meditate! ), and track your progress. Since I’m a data junky I love the exportable data of Insight Timer. Buddhify takes a different approach to mobile by providing guided mindfulness meditations based on where you are and what you’re doing. The idea being that you might not always be at home. With Buddhify you could pop your headphones in and do one while on the subway, in a plane, or while taking a break in the office. It even provides a session for use at the gym (yes, you CAN meditate during a workout). The application has a clean, simple interface and couldn’t be easier to use. Simply select your location, the ‘flavour’ you want (essentially what type of mindful meditation you want in that moment), one or two player mode, and then click ‘Play’ and off you go. Easy right? Make your select, grab a seat (I suggest being mindful of your posture), and listen to the pleasant voice provide you with an easy to follow guided mindfulness meditation. Taking a step back I’d like to point out that Buddhify is not exclusively Buddhist. The name is simply a nod to the tradition from which mindfulness meditation came from; it doesn’t preach any religious perspective. That’s one of the reasons I like it… I have a great deal of respect for Buddhism in general but I don’t believe meditation has to be aligned to any form of spirituality. In fact, you can have any belief system you want, or none at all, and still realize immediate benefits from meditation. Researchers at the University of Wisconsin-Stout designed an experiment to test how quickly meditation could change people’s brain patterns. Eleven participants “were offered two half-hour sessions a week, and encouraged to practice as much as they could between sessions, but there wasn’t any particular requirement for how much they should practice.” After five weeks, during which each person meditated for an average of seven hours, distinct changes in brain patterns emerged. More activity was measured in the left frontal lobe of the brain, an area often associated with positive emotion. The point being that you don’t have to wear an orange robe, subscribe to Buddhism, or worry that mindfulness meditation clashes with whatever your beliefs may be; meditation works regardless of any of that. So if all you have is a mental image of monks or hippies from the 60’s, feel free to toss that idea out of mind — the results are backed by science. Watch the video below for a preview of what Buddhify looks like in action. Right… we’re discussing a mobile app so let’s hit the pros, cons, and cost. Buddhify is available for Android via the Android Market for $2.49, and for iOS in the iTunes App Store for $2.99. You may wonder why it’s less expensive on Android. The answer is probably the simple fact that Apple takes a larger cut of the sale than Google does. Even at $2.49 Buddhify is on the expensive end for most Android applications. For comparison, Insight Timer is $1.99 in the Android market. Let’s be real though, if you have a $500+ smart phone and have an interest in meditation, $3.00 isn’t that much. While the app might appear a bit sparse it contains 32 different meditation tracks… so compare that to the average price of a CD and it’s quite the deal. 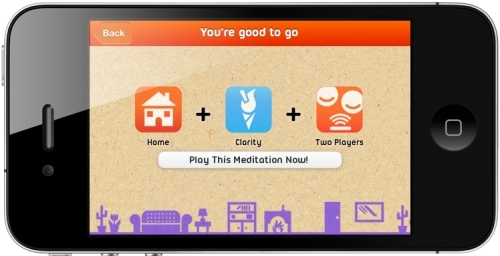 Buddhify’s biggest draw might be for those who have never meditated a day in their life. It’s simple, straightforward, and built for life a modern world. The interface is clean and gives it a game-like feel by letting you track how much you’ve completed, how often you’ve used it, and in which scenarios (work, exercise, etc) you used it most. The voice leading you on the guided meditations in Buddhify is pleasant and easy to follow. The idea was created by Rohan Gunatillake who is a long-term meditator with a professional background as digital consultant. In short, Buddhify was developed by someone who understands technology, lives an urban lifestyle, and has been practicing meditation for a long time – so you’re in good hands. Another interesting feature of Buddhify is two-player mode. Again, if you’re not familiar with meditation your mind might immediately envision meditation as a solo activity. Happily, that’s not the case (I’ve meditated with others many times) and Buddhify has the ability to allow two people to practice and experience the benefits together. Buddhify isn’t perfect. My biggest gripe about Buddhify (please note that I have an Android so I cannot comment if the same holds true on the iOS platform) is that it doesn’t disable notifications on your phone while in use. You might argue that a notification going off might be something to use during the meditation, “stay present dude!”, but really the app should disable audio for you during the period the meditation is running. In addition to that, the screen doesn’t go off while using Buddhify. Since the screen being on is the biggest vampire on your phone’s battery this should be addressed. When you’re not interacting with the application, in other words while you’re meditating, there’s no reason for the display to be on. The last two are technical issues that I’m sure could be easily worked out in future releases. In short, I find Buddhify to be a great app for someone who’s on the go and could use a convenient, simple way to take a time-out during their day for themselves. Are their alternatives to Buddhify? Buddhify’s approach is unique; and I haven’t really seen anything quite like it. If the idea of Buddhify’s approach is appealing to you then you can’t go wrong. Of course there are many other ways you could practice meditation; the easiest being to simply Free Mindfulness Meditation will turn up oodles of results as well. If you like the idea of Buddhify but don’t think you know enough about meditation below are some links that might clear it up for you. Just so you know though… meditation requires very little “understanding” of meditation to do. In fact, sometimes the more you know, the more you attach to a particular notion of “the right way to do it”. Don’t let any of that dissuade you though; experienced or not meditation provides a ton of benefits. and perhaps my favorite for introducing someone to Mindfulness Meditation is Jon Kabat-Zinn’s “Mindfulness for Beginners“.